We have a few favorite family recipes, and this is one of them. We love having these slow cooker pork carnitas in tacos, and this recipe makes amazing leftover enchiladas! I hope you enjoy this recipe as much as we do! 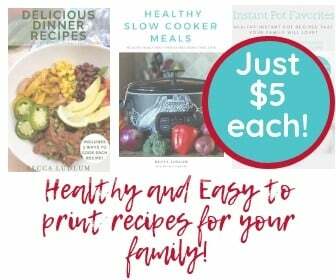 Updated to include Instant Pot instructions! 1. Slice one onion into thick slices and line the bottom of your crock pot with them. Dice the other onion and set aside for a topping. 2. Place pork tenderloin on top of the onions and sprinkle your spices (and place bay leaves) on the pork. 3. Pour 1/2 bottle of salsa, entire can of Rotel, and diced onions on and around pork. 4. Cook on low for 5-8 hours, depending on the size of your tenderloin. 5. Pull pork out and shred it, then add it back into the crockpot. 6. Serve with the rest of the bottle of green chili salsa, warm flour or corn tortillas, diced onions, and sour cream. For Weight Watchers, this recipe is 3 Smart Points per serving (assuming 8 servings). If you add sour cream, a reduced fat variety is 2 extra points per serving (2 Tbsp). 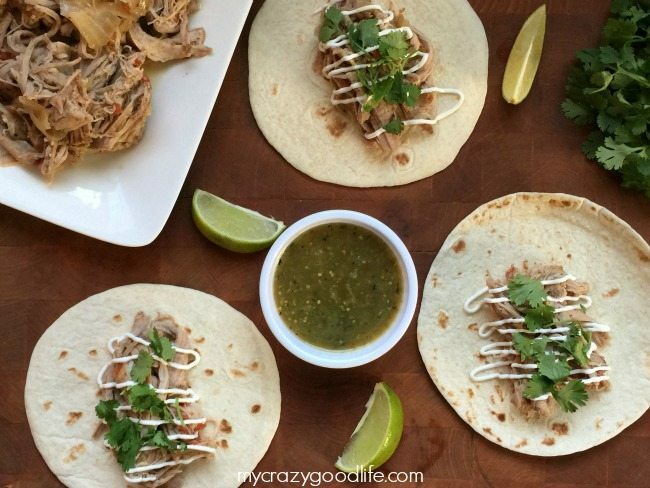 This delicious Crock Pot Pork Carnitas recipe is a family favorite! It's easy and uses only a few ingredients, too! Previous Post: « Botox for Migraines: Does it Work? WHAT, IF ANYTHING, CAN BE DONE WITH THE REMAINING SAUCE IN THE COOKER? Hey Betty, I don’t use the extra sauce in the cooker. We use the meat out of the cooker and then discard the rest. I take the chunks of pork and put under broiler until crispy. Then stir the liquid until reduced. Serve the reduced sauce along side with separate green salsa. 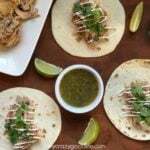 Yum crispy pork tacos with 2 sauces! Love the flavor of this recipe! 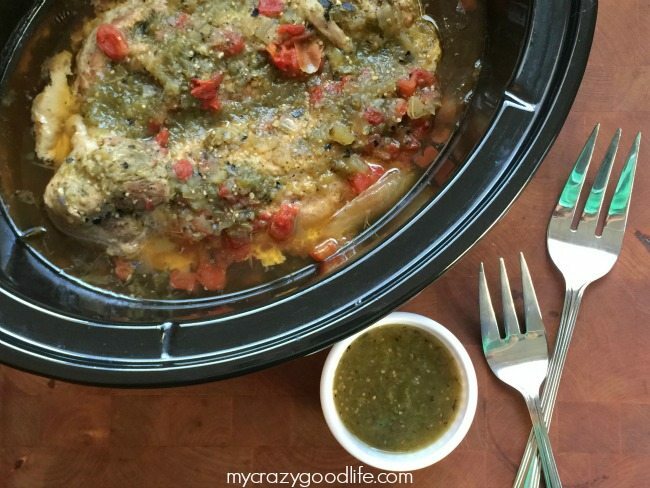 Thx for this crock pot pork Carnitas ! I dumped everything remaining into a blender, added extra tomatoes and spices to make a sort of enchilada sauce. Thin it out with some stock or water if you want. 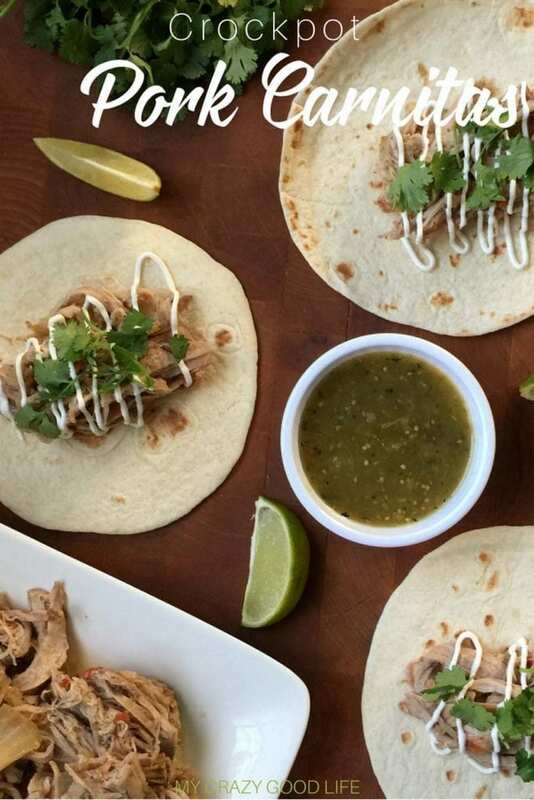 Delicious addition to the tacos! I just want to confirm 2 teaspoons of chili powder and 2 teaspoons of cayenne go on the pork. It doesn’t look like that much in the picture! I’m sure you could, just follow your slow cooker directions! Maybe a little less time if you’re cooking on high. I can’t find the 21 day fix servings this equates to. Am I missing it? Thanks! I’m going to try this over the 4th weekend. We love Mexican with pork. By the way – were you aware that when you click on this recipe on the main screen of Pinterest you get a recipe for orange roughy? Hi I was wondering how spicy you think it will be? I got mild salsa. But with the Cayenne pepper? my husband is a wimp with spicy but i want a little kick. :) maybe i’ll cut back on the cayenne pepper Thanks! What size tenderloin did you use? I’m trying the recipe with about two pounds, and I would like to know if the ingredients are sufficient as listed or if I need to double them. Thank you! About 2 pounds, Sarah. Sorry, I think I accidentally answered Jenn in an email and not on the blog! And how long did you cook your two lbs for? I usually cook it for about 7 hours! I’ve never done that, but I bet it would be SO good!! Thank you soooooooooooooooo much for this recipe. Looks so good!! Made this once already in tacos, family LOVED it. Kids and all ! Now, husband wants me to put this on enchiladas…. What should I do for sauce on top ?? Melissa, it’s delicious with red sauce! Also, try to use the recipe with beef-it’s sooooo good! Made this yesterday and it was delicious! We like spicy foods so a chopped and added about 4 tabasco peppers. So spicy! Lots of leftovers too! I was wondering if you have a printable version of this recipe?? I like to print delicious recipes and put them in a binder to reference later. Thanks! When do the diced onions come into play? 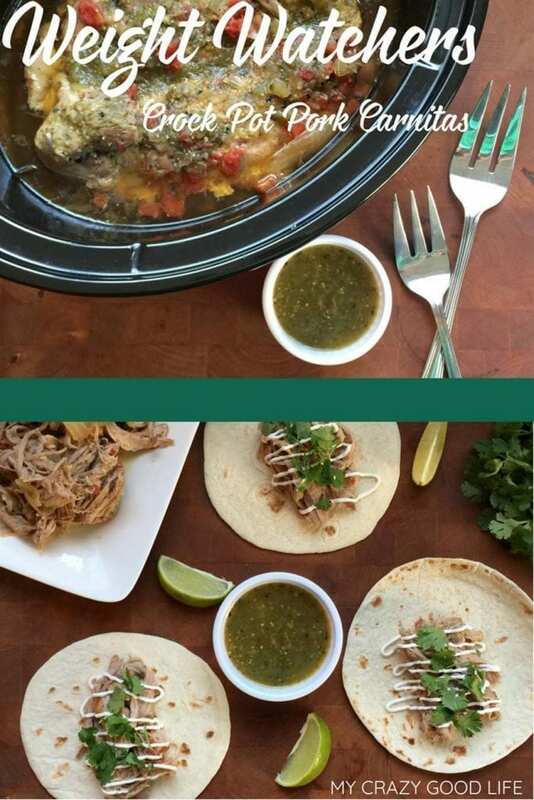 Do you have instructions for making this in an instant pot? Am I correct in reading that you do not use the sauce in the pot at all? So you discard it once you take the meat out? Or do you put the shredded pork back in the sauce in the pot? I’m curious. Did you mean to say 80 minutes in the Instant Pot? 8 minutes does not seem like enough time to me? I’ve made this recipe many times in my slow cooker and love it but I wanted to try it in my new Instant Pot. I have a stonewear lot for my oven but at what temp. And how long would you put It in the oven for . Yes! Most all recipes online are for 6qt, unless otherwise noted! That being said, I have had readers tell me that they can easily make the recipes I post in their 3qt without modifying them at all.